Highlights from the pet industry's largest tradeshow! 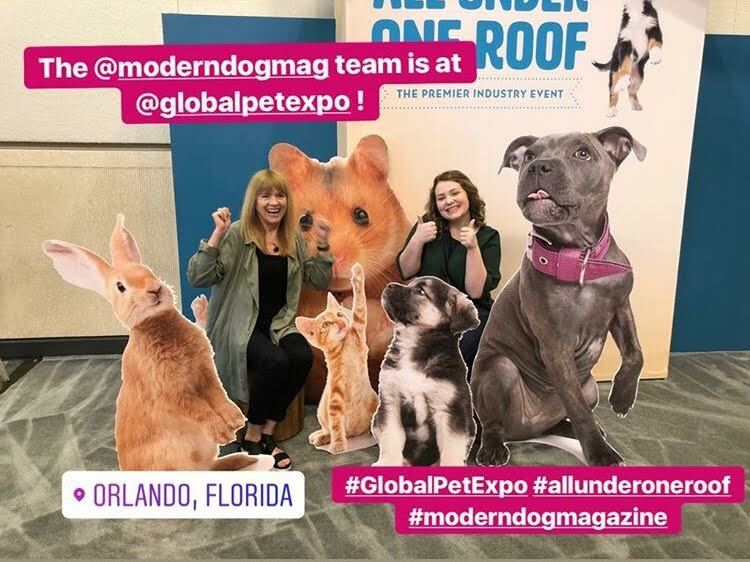 The Modern Dog and Modern Cat team had SUCH a great time in Orlando at Global Pet Expo… despite the pouring rain and tornado warning! Everyone came out full force to celebrate APPA & PIDA’s milestone anniversaries, as well as meet and greet with peers from the pet industry. We’re already excited for next year, but for now, here’s a breakdown of some of our favorite products and things we saw! Dogline is an amazing company that makes fabulous toys, collars and leashes, and more! We brought home some awesome product samples including some interactive squeaky toys for our office dachshunds, Penny and Esther. Dogline is on Instagram at @doglinegroup. We had a celebrity spotting at the Petbiotics booth! Brooklyn the bulldog is Petbiotics' mascot, and he was having a great time meeting his fans at Global Pet Expo! We love how Petbiotics creates such fabulous probiotic-powered shampoos and cleaners. You can follow them at @Pet_Biotics on Instagram! This adorable pup at the Spina Organics booth captured our hearts! He looks just like a teddy bear. Spina Organics is an amazing company that makes specifically pH-balanced organic grooming products, biologically designed for dogs' skin. Check them out at @spinaorganics! As longtime fans of Bowsers Pet Products, we always love seeing the new luxurious pet beds and other cool products they come out with every year! The bed in the forefront is featured in Modern Dog's Spring '18 issue. See more of their product line here or follow them on Instagram at @bowserspetproducts. This Australian company makes absolutely beautiful items, using prints of indigenous Australian art on their beds, bowls, collars, and leashes. Plus, a portion of proceeds from the sale of all items go back to Warlukurlangu Artists Aboriginal Corporation! Check them out here or follow them on Instagram at @outbacktails. Yum! The fab @thebearandtherat makes tasty frozen yogurt for dogs. Super nutritious and dogs love them! Check out their cool treats here. We saw adorable PUPPIES at the Fetch For Pets booth! They were sweet, playful, and adoptable! At their booth we also saw a lot of amazing toys, treats, chews and more! Definitely worth checking out. You can follow them at @Fetch4Pets. We love the fabulously protein-rich Jiminy's Crickets! They were proudly displaying their Modern Dog article feature in our latest Spring 2018 issue. Check them out on their website or Instagram (@jiminysforpets) if you're looking for a new high-protein source that is sustainable and delicious!